What are the core stability muscles and why are they important? You have probably been told to engage your core stability muscles in your yoga class. But what are these important muscles and how can you recognise them? Core stability is the ability to control the movement and position of the muscles of the central ‘core’ of the body. Muscles can be split into two main groups. The outer mobilising muscles are concerned with movement and the inner core muscles which help to stabilise the body and maintain good posture. The muscles that our friendly body builder is flexing are the outer muscles. The core stability muscles are deep inside and are not visible even when engaged. 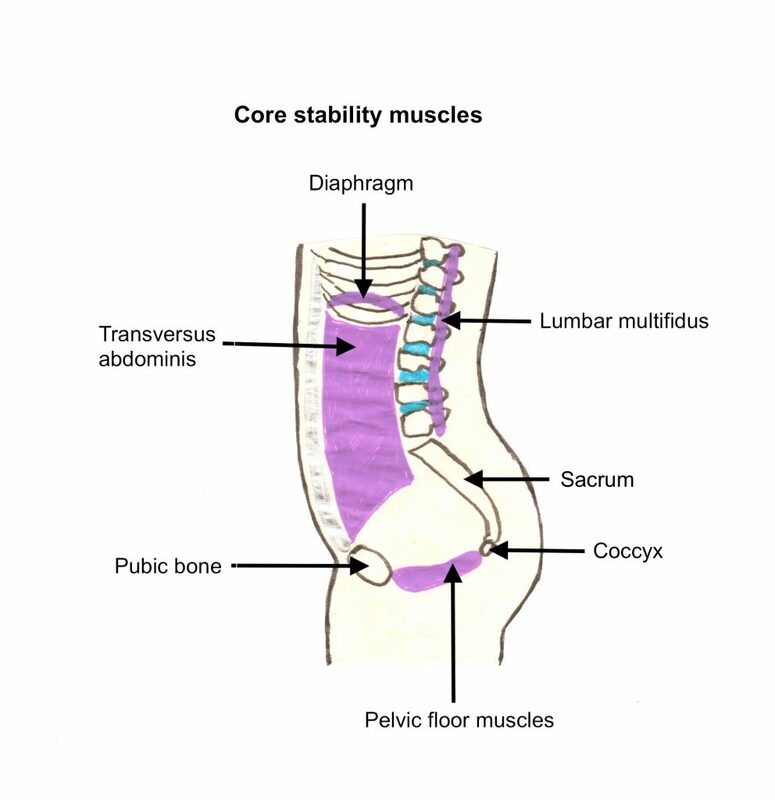 The core stability muscles are the transversus abdominis, lumbar multifidus and the pelvic floor muscles. These three muscles groups along with the diaphragm work together to hold the body upright. The pelvic floor muscles are the easiest to identify. These are the muscles that are used to stop the flow of urine midstream. They are attached to the pubic bone and coccyx supporting the bottom of the pelvis. The transversus abdominis is the inner most layer of the abdominal muscles and acts like a corset to stabilise the pelvis. To identify these muscles breathe out and slowly pull the naval in towards the spine. The lumbar multifidus muscles connect each vertebra of the spine with the next. Their main function is back stability. These are the hardest group to identify. As you exhale and draw the naval towards the spine, visualise a zip being closed slowly along the length of the spine starting at the base. In a healthy person the core muscles should engage before any movement of the limbs and torso. Overtime bad postural habits or injury can mean that the core muscles become weak or lazy resulting in the outer muscles taking over. Therefore it is important to strengthen the inner core muscles. To improve core strength these muscles need to be activated everyday. An easy exercise to perform is to lie on your back with both knees bent and feet flat on the floor. Take a deep breath in and as you exhale gently contracting the pelvic floor muscles and then slowly pull your lower abdomen towards your spine. Try and keep the core engage for 10 seconds whilst breathing normally. Relax and then repeat. Standing in a good mountain posture will also help strengthen the core muscles. Start with feet hip width apart and keep the knees soft. Check that the pelvis is in a neutral position. Exhale and engage the core muscles. Lift up from the sternum, this will also help activate the core. Take your shoulders up towards your ears and roll them back allowing the shoulder blades to slide down into their pockets. Now keep the arms relaxed by the sides of the body and check that the chin is parallel with the floor and slightly back. Build up to holding this posture for 10 minutes. In yoga engaging the core muscles is important. Therefore allowing for safe transitioning in and out of postures. Yoga performed correctly strengthens the core stability muscles. Remaining active and practicing yoga will keep the core stability muscles and back healthy. Having a healthy back where both physical and subtle energy moves freely increases vitality and happiness.